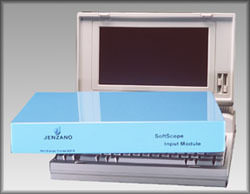 SenScope® is a fully programmable, standalone data acquistion system. Although primarily designed to interface with a variety of weld controllers and sensors, its ability to monitor and compare data broadens its applications. The SenScope® utilizes either PC-compatible software or the onboard FORTH interpreter running on a 68008 platform for high speed. The SenScope® Software allows the user to program the Input Module, making use of pull-down menus and full English prompts; therefore, no programming experience is required.